Ideally, you should start on your anti-aging routine in your twenties. But, let’s say you didn’t. It’s never too late to get started on the road to younger, healthier looking skin. 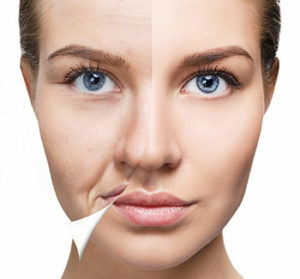 As skin ages we lose collagen, elastic tissue and the fat layer of our skin thins out giving us loss of volume and wrinkles. Most loss is the result of natural aging, but it can be accelerated by other factors, such as sun exposure. As people age, skin thins out, gets dry, becomes inelastic, may develop freckles, and wrinkles and creases become more and more dominant. Sunscreen: I can’t say this enough. No matter if it’s a bright, sunny day, cloudy, or even raining, every morning, apply sunscreen to every area that could be exposed to the sun. And, of course, use a broad-spectrum UVA/UVB sunscreen of at least SPF 30. Fillers: Dermal fillershelp diminish facial lines and restore volume and fullness in the face. These are great for plumping up thin lips and softening facial creases and wrinkles. Microneedling stimulates the skin’s own ability to produce collagen. And now, adding PRP with microneedling, you’ll have even greater collagen production. Microdermabrasion gently exfoliates dead skin cells from the topmost layer of the skin. Laser Genesis provides subtle improvement in fine lines and large pores by helping to build collagen naturally. Limelight Facial is a non-invasive light-based skin rejuvenation treatment that improves skin tone and surface imperfections associated with aging and photodamage. Peels brighten skin color and improve clarity, tone and texture. Our goal is to help you have and keep your skin looking its best. Let’s get you on a great regime now and adjust it as you age. Please feel free to contact us to make an appointment.